Organic Acacia Tuscan Honey (250g) Produced with organic agriculture methods in the Tuscan countryside, this is the perfect every day honey. It goes well with Pecorino and Parmigiano Reggiano. Bergamot Marmalade (250g) Made from Bergamot citrus fruits, this tangy Marmalade can be paired with hard cheeses like Italian Parmigiano, Pecorino or Grana Padano and English mature Cheddar, Crumbly Lancanshire or Red Leicester. Extra Fig Jam (250g) This jam made exclusively with sweet Calabrian figs has a summery flavour and complements all strong, seasoned cheeses. Prosecco Jelly (120g) You can really taste the Prosecco in this natural hand made jelly, we love it with Ricotta and Goat's cheese. Orange Mostarda (120g) This fruit mustard is made in Mantova, Northern Italy with fresh oranges and a few drops of mustard oil to give a perfect balance of sweet and spicy. It works well as an accompaniment to mature and strong cheeses. Cheat Sheet suggesting cheeses to pair with each product. 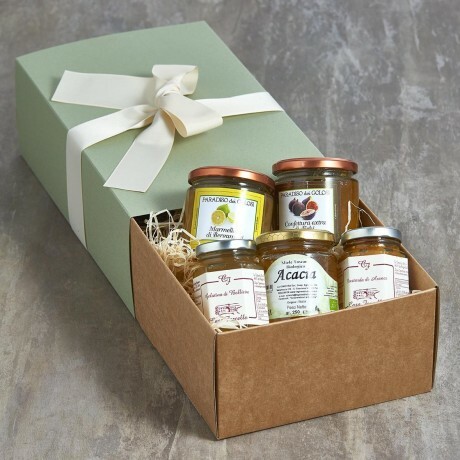 Our five spreads are presented in a lovely box and tied with a pretty bow. A gift message option is available at the checkout. Please note that if we are out of stock of any item we reserve the right to substitute it with the most similar available item.